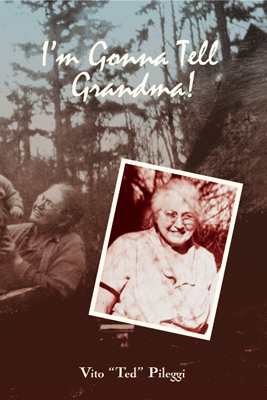 Coho Publishing : I’m Gonna Tell Grandma! “This collection of events took place during my youth, most of them being the same stories that my mother likely would have written. Only, she would have put a slightly different slant on them. There were six of us, four boys and two girls, I the oldest. And because I was the oldest, it was I who always caught hell when something went awry. Yes poor unfortunate picked on methe most humble and innocent of the lot. And it never did me any good to deny involvement. By the time I was ten, my vocabulary consisted of twelve words of which six were, “Who, Me? What did I do?” I’d also compiled a notebook of alibis and excuses to fit every occasion. Our grandmother, a nice, gentle, peaceful lady when in a coma, was tough as rawhide and a strict disciplinarian. Actually, she was a peach but when she was on the prod, she could break up a union strike with her scalding voice. And whenever one of us did something wrong, she was usually the one who threatened to administer the punishment and did on occasion, but not nearly as often as we deserved. Our family wasn’t much different from a lot of others during the times. We lived on a small farm in a tiny run-down house with no indoor plumbing and were very poor but we children didn’t realize it. After observing our cramped living conditions, an elderly friend once commented that our family reminded her of a can of sardines. Being a curious seven-year-old and never having heard those words used in that context before, I wondered why in the world she said that about us. Sardines were dead fish that smelled. Since we weren’t dead, I concluded that she thought we stunk. That seemed to explain a lot of things, one being why people referred to us as a bunch of little stinkweeds. My folks were married during the Great Depression and I’m sure they often worried about the lack of money to run the household but having none presented no huge complications in our lives. We grew together, played together and sometimes we fought and bickered. But, in the long run, we loved and cared for each otherand still do.